Anyway, time goes on, as it does, and the detours-based-on-profession now involve architecture, which is nicer to look at (usually) and much less fragrant (always). And that’s why on our recent trip to Chicago we took a two-hour drive from the city to go look at this house. It’s famous. And so is the architect. The house is adjacent to (and sometimes, depending on flood conditions, in) the Fox River; this is the river-facing side. 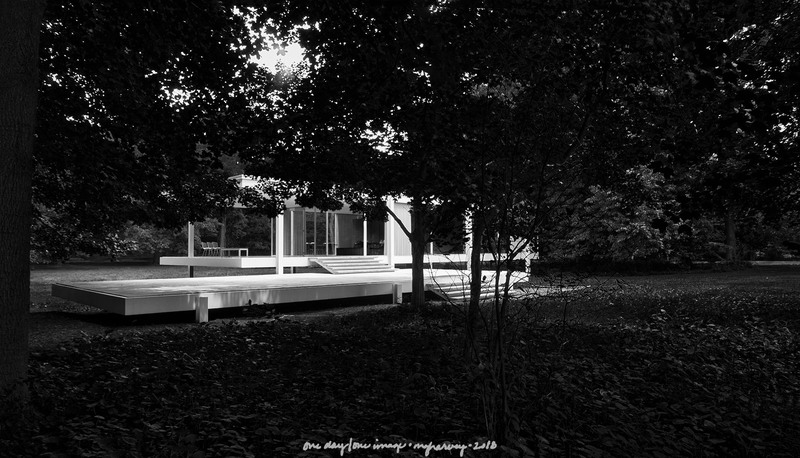 Posted on July 13, 2018, in Photography and tagged 365 photo project, architecture, black and white photography, Farnsworth House, landmark building, learning to see, Leica, melinda green harvey, Mies van der Rohe, monochrome, thoughtful seeing, travel photography. Bookmark the permalink. 4 Comments. I prefer your diversions. Not being an expert this makes me want to be there. Guess it doesn’t come within one of my favorite which is the Prairie style. Love any history you share with us. A very nice rendering. I’ve always felt that this house was probably better to appreciate as a piece of art than a home. Nice to look, but I don’t think I would have liked to live in it.